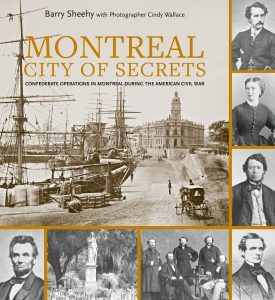 Montreal hosted the Confederacy’s largest foreign secret service base during the Civil War. Montreal banks and other Canadian financial institutions held a million dollars or more in hard currency or gold to fund clandestine activities. When Jefferson Davis fled the U.S. in 1865, Montreal welcomed him and his family. Overrun with refugees, soldiers of fortune, spies, assassins, bankers and smugglers, Montreal was a pro “Secesh” town. From the city’s grand hotels, plots of all sorts were hatched, including the infamous St. Albans raid and the Lincoln kidnapping, which mutated into an assassination. Influential British-Canadian bankers joined Confederates as they launched a successful assault on the new “Greenback.” When John Wilkes Booth was shot, a bank draft signed by Montreal banker and future mayor Henry Starnes was found in his coat pocket. Surprises are not limited to the Confederacy. The level of corruption in the Northern war effort, as suggested by the names registered at the St. Lawrence Hall—Montreal’s finest hotel—is breathtaking. Opposition to Lincoln from both parties ran deeper than is generally acknowledged. Based on original archival research and his previous books on the Civil War, Barry Sheehy challenges core tenets of the American Civil War narrative. Moreover, his case is greatly reinforced by the many photos taken by internationally celebrated photographer William Notman. A number of these photos have never been published before. Cindy Wallace is a photographer and an art and photography professor with a Master’s in Fine Arts from Georgia Southern University. Her work has been exhibited throughout the United States. Along with Barry Sheehy, she received the Lieutenant Governor’s Award for Excellence in Research in 2012 for the book Savannah: Brokers, Bankers and bay Lane – Inside the Slave Trade. She lives in Amarillo, Texas.